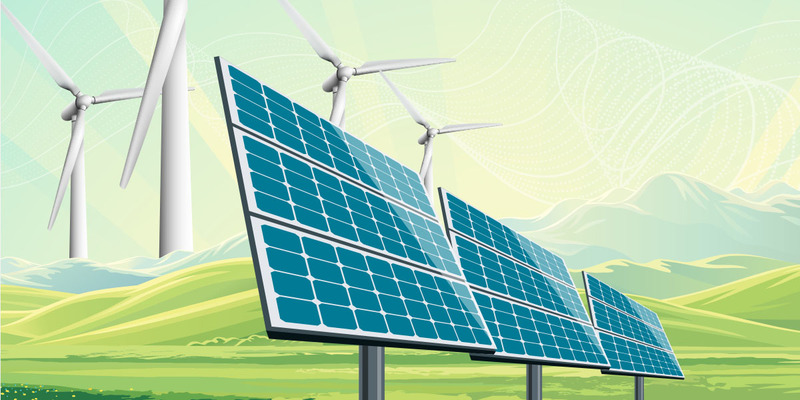 Wind and solar are quickly gaining ground in today’s fast-evolving energy marketplace, where large-scale renewable energy procurement is a viable option for even the smallest institutions. That same cheerful outlook for renewable energy is echoed in the International Energy Agency’s World Energy Outlook 2017. The report suggests that among the four biggest shifts underway in the global energy system is the “rapid deployment and falling costs of clean energy technologies,” with new solar photovoltaics dropping by 70 percent since 2010, along with a 25 percent cost reduction for wind and 40 percent fall in battery costs. The report further shows trends toward renewables capturing two-thirds of power plant investment worldwide heading to 2040 as renewables become the lowest-cost source for many countries. Another key trend providing a boost to renewables is the electrification of energy consumption. According to the report, for the first time, in 2016, global investment in electricity outpaced investment in oil and gas. One way to move forward is through large-scale renewable energy procurement. To this point, many higher education institutions have been slowly tip-toeing into renewable energy through mostly smaller on-site projects, says Chris O’Brien, director of higher education programs for Edison Energy. While beneficial, this may represent a small fraction of the energy use of a particular building, let alone an entire campus, he adds. Now, the costs of large-scale procurement—and the contract structures to support these initiatives—have evolved to a point where energy buyers can make a much more substantial impact on their energy costs and carbon reduction goals, argues O’Brien. 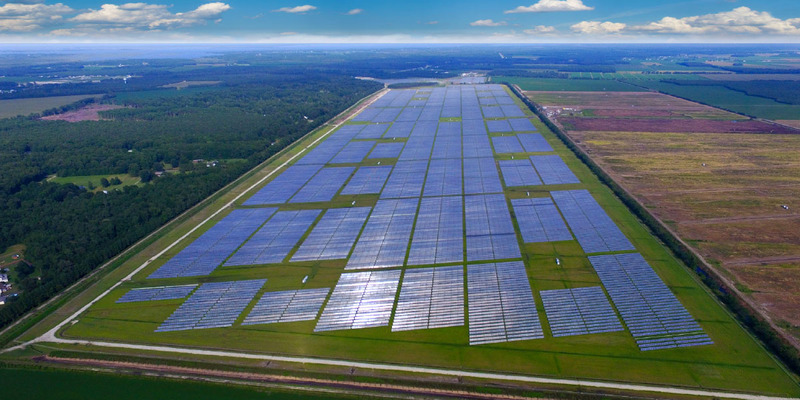 The 255,000-panel, 60 MW Summit Farms solar PPA in North Carolina delivers carbon-free electricity for Massachusetts Institute of Technology. The 650-acre array is quadruple the size of the MIT campus. 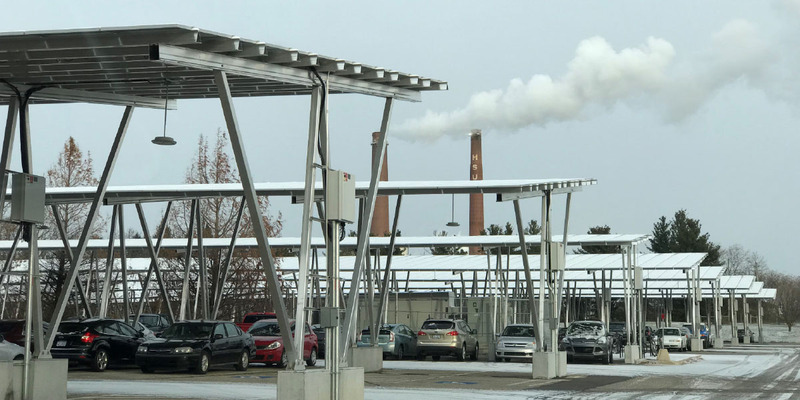 The solar canopies covering parking spaces in five lots on the campus of Michigan State University are part of a 10 MW PPA. The canopy height accommodates not only snow removal equipment but also recreational vehicle parking, since MSU’s football Saturdays draw tens of thousands of tailgaters. $3M — The University of Minnesota has saved $3 million annually on utility costs. About 14 percent of its current energy purchase is 100 percent renewably sourced. Plans to implement the new solar energy installations at the University of Buffalo over the next four years are projected to infuse more than $250 million in economic impact for the region and yield $125 million in energy savings. 71% — At present, SUNY Cortland’s aggregate REC purchase on the national market represents about 71 percent of the university’s electricity needs. In the first full year since the solar array came online at Chesapeake College, the college’s annual electric costs dropped by approximately 40 percent—from $600,000 to $350,000. Among the earliest examples of a higher education large-scale renewable energy power purchase agreement (PPA) is the Capital Partners Solar Project—a 20-year, 53.5 MW agreement that partnered up George Washington University, American University, and the George Washington University Hospital, all located in Washington, D.C.
As the anchor partner, GWU agreed to purchase 70 percent of the output of the North Carolina–based solar farm. This share accounts for 50 percent of GWU’s electricity consumption and equates to an estimated 30 percent reduction in the university’s carbon footprint, notes Meghan Chapple, director of GWU’s office of sustainability. The project, now in its fourth year of operation, is performing as anticipated, says Chapple. In addition to decarbonizing GWU’s power supply, the project provides a price cushion against the fluctuations of the 50 percent of conventional brown power on which the university still relies, helping the university manage its risk exposure. Start by working with an adviser. “Be aware that many brokers out there may have a vested interest in pitching a narrow set of solutions,” warns Chapple. By contrast, an adviser can help you first determine the best strategy and find the right project for your group. There is now also a robust network of nongovernmental organizations like Rocky Mountain Institute, World Resources Institute, and Renewable Energy Buyers Alliance that provide helpful resources to assist with understanding this fast-evolving marketplace, says Chapple. For maximum exposure to the sun, nearly 17 percent of the photovoltaic solar panels of the Borough of Manhattan Community College’s rooftop array are hung vertically on BMCC’s cooling tower enclosure walls where they enjoy unobstructed western and southern exposures to the Hudson River and One World Trade Center, respectively. The remaining panels are positioned completely flat. The zero-degree angle is rated to withstand the greater-than-100 mph winds that can gust across the city’s West Side Highway. In the heart of New York City, below the towering view of One World Trade Center, the Borough of Manhattan Community College/CUNY still manages to capture plenty of sunshine. BMCC’s Chambers Street main campus building spans four city blocks. That’s essentially as long as the Empire State Building is tall, minus its antenna, notes Scott Anderson, BMCC’s vice president for administration and planning. Atop the roof of the one-million-square-foot, seven-story building are 947 photovoltaic (PV) solar panels capable of producing more than 1 MWh of clean electricity daily. The college’s array, which became fully operational at the end of 2017, is projected to save about $42,000 annually on BMCC’s electric bill. 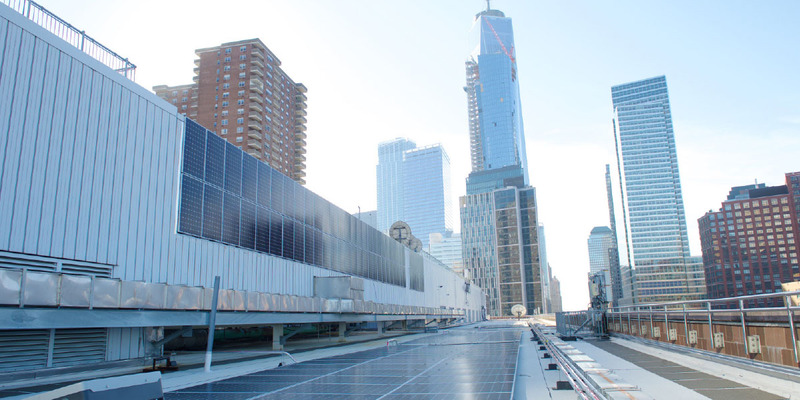 Currently the largest PV facility in Manhattan, the project is also the first vertical solar array in New York City ever designed and installed by the New York State Power Authority and is a demonstration test case for NYPA. Incentive for New York City and for New York State to dramatically reduce energy consumption and transition to clean renewable sources provides wins all around. BMCC’s electric bill is paid for by the city, which directly reaps the financial savings, while the college receives the carbon credits. And, the state inches one step closer toward fulfilling the governor’s efforts to dramatically increase solar power throughout New York State and to supply 50 percent of the state’s electricity from renewable sources by 2030. Unexpected advantage in project delays. The installation was a long time coming—more than six years from the time the Borough of Manhattan received the initial $3 million capital support grant, securing matching funds from the state for a total of $4.9 million. The holdup wasn’t related to the project though, notes Anderson. “We first had to secure funding to replace our 30-year-old roof.” The delay also meant that by the time the college was ready to install the PV array, the sophistication and efficiency of the panel technology had further improved. Other enhancements ensure efficiencies. Another boost to the effectiveness of the installation is that in the meantime, BMCC was also able to tackle a range of energy conservation projects. Since 2014, BMCC has invested $3.3 million on a new chiller; variable frequency drives; control valve thermal blankets; steam traps; multiple LED lighting upgrades; and the addition of lighting controls, sensors, and ballasts. Combined, these and other actions have contributed to a 19 percent reduction in electric consumption and an annual cost savings of $1.8 million. And, the lower electric requirement contributes to the effectiveness of the array, making it even more efficient and reliable as a power source, notes Anderson. As of this spring BMCC is moving forward on a separate, albeit connected project, which is to explore battery storage. Critical project management partners once again include NYPA as well as the New York City Fire Department to ensure the project meets code, notes Anderson. The collaboration will incorporate two 100 kWh backup batteries to serve as energy reserves during peak load periods, helping alleviate some of the strain on the city’s electrical resources by feeding excess from BMCC’s array back to the grid. The electrical reserves would likewise provide BMCC power for critical functions in the event of a blackout or other emergency situation. Plan now to attend the 2018 Finance and Facilities Leadership Workshop, Sept. 23, 2018, in advance of the 2018 Planning and Budgeting Forum at the Omni Hotel & Resort in Louisville, Ky. This APPA/NACUBO joint forum will help prepare business, finance, and facilities officers to more effectively lead the efforts to advance their campus operations, including strategies to improve facilities for energy efficiencies and more sustainable operations. Listen at your leisure to a previously aired NACUBO webcast on Containing Cost and Risk With Renewables: The Power Purchase Agreement Story. There is no shortage of information related to renewable energy procurement. Check out these helpful resources. Large-Scale Renewables: The Next Chapter in Higher Education Sustainability Leadership, a white paper by Second Nature and CustomerFirst Renewables. Aggregating Higher Education Demand for Renewables: A Primer, a background paper developed by AASHE in partnership with Edison Energy. AASHE’s Database of Campus Green Power Projects (https://hub.aashe.org/browse/types/greenpowerproject/) includes more than 700 on- and off-campus solar, wind, and hydroelectric projects that include PPAs. The Midwestern Higher Education Compact’s Renewable Energy Initiative timeline provides a glimpse into the level of detailed planning and process requirements related to group power purchase agreement decision making. Among the tools available from CustomerFirst Renewables are an online calculator to help estimate the cost savings and emissions reduction potential from large-scale renewable projects, and an overview of regulated versus deregulated electricity markets. Second Nature’s Climate Leadership Network is a major driver of higher education largescale renewable energy initiatives.